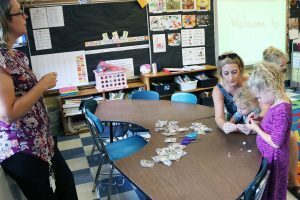 OSWEGO – Leighton Elementary School students who could barely contain their excitement for the start of the 2018-19 school year once they were able to have a sneak preview during the building’s recent Meet the Teacher night. First grader Charlise Wiegand, right, puts together her Lego character which will be used to help track her progress throughout the year. Students and their families flocked to the inaugural event where they were able to drop off school supplies, navigate the hallways to find their classroom, meet their teacher and become more acquainted with their new learning spaces. Principal Kara Shore said Meet the Teacher night was put together after Leighton teachers received responsive classroom training over the summer and wanted to offer one night to ease any anxiety students may have had about starting school and getting used to new environments. It also is the first step in building the Leighton culture this year, she said. Once school begins and students have settled in nicely, the school will offer an open house night and several other activities throughout the school year. The Wiegand family was enthusiastic for the preview. A quick visit to the school helped ease the mind of incoming first grader Charlise, according to her mother, Tonyajo. In her new classroom, Charlise put together a Lego character which will be used to help track her progress throughout the year. She was accompanied by younger siblings, including incoming Leighton kindergartner Shelby. The girls’ father, Tom, is a fifth grade teacher there. Shore said she looks forward to seeing all Leighton students when the school officially begins Sept. 5.